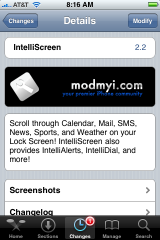 There is an update to IntelliScreen 2.2, a lock screen enhancing application, in Cydia today. Below is a complete list of changes, bug fixes and known problems. One things that I did find interesting is that the update is said to make IntelliScreen compatible with firmware 2.1 however, Doug and I have both been using IntelliScreen on our 2.1 for a while now and it seemed to work fine. So, I’m not sure what the deal is with that. 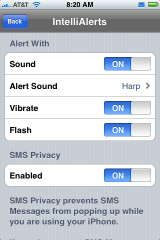 One cool new feature includes a new vibration alert that will vibrate with; Mail=2 fast beeps, SMS=2 slow beeps, Call/VM=3 beeps, Calendar=4 beeps. Another cool new feature is that after you make your changes in IntelliScreen, it no longer resprings the SpringBoard. After you make the change and select Apply, the app just closes. It is kind of weird at first because you expect it to respring but I definitly like it!! They also say that that overall InteillScreen is now faster. I personally didn’t notice that it was any faster but, maybe I will notice it as I use the update more. I would definitly like if it was faster! Check out the rest of the new features in the list below…there are quite a few! I have found that I still have issues between QuickGold and Intelliscreen. Since I updated Intelliscreen doesn’t appear all the time when at the lock screen. I un-installed QuickGold and it did, so the 2 still dont like to play with each other. I also noticed that I had to lock and unlock at times because if I left the phone at the lock screen to long it would stay locked forcing me to lock (power button) to get a response. this update makes my phone crash to safe mode now every time I get a call or make one now. It really annoying. Same here!! I had to uninstall QuickGold!! I’m only getting crashes in the mail app. It runs for about 10 seconds and crashes. If I disable intelliscreen, mail is fine, I enable it, mail crashes. Everything else “seems” to work, though. i seems to have the same problem. IS 2.2-1 Working great so far on 2G Pwned with 2.1 firmware and iTunes 8.0 (of course). I’m still getting the bad mail behavior with intelliscreen enabled with the new update. Hopefully it will be fixed soon. Mail is extremely unstable. Frequently when opened it will crash a few seconds later. On 2 occasions when locking the iphone it crashed causing the phone to enter safe mode. This app is very flaky. Try focusing on stability instead of a kitchen-sink suite of features. Brining the Windows SmartPhone desktop to the iPhone is cool, but not when it breaks core functionality like mail, and dumps the phone into safe mode. Inteliscreen was working great before 2.1, so I’m pretty sure it’s just the upgrade that broke mail. And so far, that seems to be the only problem. I’m sure it will get fixed shortly. I’ve gotten so used to having this app, that it’s really annoying having to keep it disabled. New update is out, and it seems to be working for me. No more weird mail crashes. I’m keeping my fingers crossed.